The capital city of Saxony, an area of Germany that was part of the former East, is Dresden. The city suffered badly during the Second World War with most of the architecture being totally destroyed. Over the years a number of the beautiful historic buildings have been reconstructed. The city lies on the River Elbe and is crossed by four bridges all served by the large tram system. In DDR times the fleet was made up of Tatra T4 trams. These are gradually being replaced by low-floor Siemens trams and more recently by Bombardier vehicles. The tramway also has a goods tram service between the railway and the new VW car factory, called the ‘CarGoTram’ and is featured here. The programme starts with a short Photo Gallery shot in 1991 when the fleet was changing livery from the Communist red and cream livery to the present day yellow and black scheme. Our filming starts at the Hauptbahnhof and then continues around the city at various locations. These include St. Petersburger Straße, Waisenhaußtrase, Theaterplatz, Augustusbrücke and Neustädter Markt to name but a few. There is also footage on the Carolabrücke and by the superb Zwinger Palace. Plenty of action for you to enjoy. Our second visit on this programme is to the attractive Vogtland town of Gera. There are three main routes here on the metre gauge track. The current fleet is made up of modernised Tatra KT4D trams, some fitted with low-floor sections and in 2006 newly delivered low-floor cars to the NGT8D configuration built by Alstom. The filming takes place around Heinrich Straße and Breitscheid Straße. The trams are in a modern yellow and white scheme that also replaced the familiar red and cream livery from the bygone era. 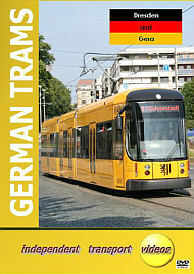 This video is an excellent companion to our German Trams 3 and 5 programmes featuring German Tram systems from the former DDR. All available now.